And so endeth the latest series from Ricky Gervais. A rather curious ending in fact, as this was by far the weakest episode of the series - overly ponderous and resembling an elongated advert for Coldplay. But it proved a fairly neat conclusion regardless, and with 'Derek' set to return for a second series - a good foundation to continue from. The reflective series finale focussed largely on Derek's family history and relationship with his absent father, using the funeral of one of the residents to amplify emotions. Gervais also used soppy music, montages and the slow pan of the camera to evoke sadness - a somewhat cheap shortcut. Especially when followed not long after by a ten minute long version of Coldplay's 'Fix You'. I like Coldplay but even I know that's a bit too long. It's something of a shame that the series effectively ran out of steam. There were plenty of terrific moments across 'Derek' to rank up there with the best things that Gervais has ever done, from Karl Pilkington's triumphantly on-point rant in Episode One to the poignant rap delivered by Doc Brown in Episode Five. Admittedly, there were also a string of terrible opening scenes, and again here, with a bizarre viral video featuring a monkey riding a pig. Yet the success of the finale was in finally transforming the dreadful Kev (David Earl) into a sympathetic character. The honesty and vulnerability shown in this episode almost justifies his consistently grotesque behaviour. Where was this Kev even a few episodes ago? The sympathetic manner in which he opened up and cited Derek as an inspiration was perhaps the most defining moment of the series. 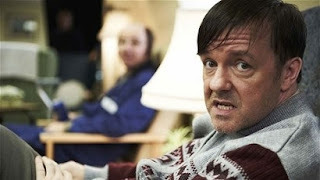 The early criticisms of Gervais making light of the handicapped were utterly unfounded - his portrayal and writing of Derek as a central character was handled with tact. Unfortunately, he occasionally dropped his act in Derek's most emotional scenes, which lost some of the undoubted power of the writing. Elsewhere, care home manager Kerry Godliman and handyman Karl Pilkington utterly excelled in their roles - characters that provided effortless drama and heart, ones we need to see more of on television. Watch the entire first series of 'Derek' on 4oD for a limited time.